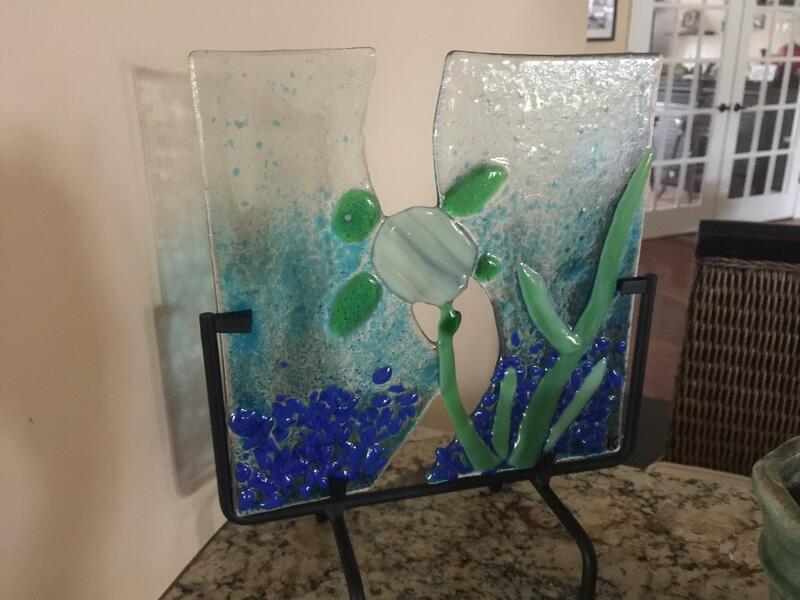 Want to learn how to make fused glass art? Glass Impressions offers classes for all levels of experience. Beginner classes will teach you about using hand tools and guide you through simpler projects. In the more advanced classes your shapes can become more sophisticated with the use of power tools such as grinders and ring saws. We offer seasonal classes, such as Christmas ornaments and projects for visitors who want to make their own souvenir. Glass impressions has classes for children as young as 5. Go to the Calendar page to see the schedule of classes. Click on the class title to register. Bring your vision of the underwater world to life in a glass panel. This is a great introductory class that teaches students to create turtles and fish and and builds confidence for beginners. Class includes instruction, base glass, accessory glass, and kiln firing. 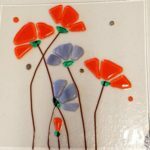 Instructor will demonstrate glass cutting, discuss fusing techniques, and provide assistance for student projects. Create a ‘swirled’ vase to match your style. In this class you will learn cold working techniques used to prepare the glass for firing. Choose your size and style. The basic vase is where you let the patterns in the glass be the art. An embellished vase allows you to put your own stamp on the design by adding accessory glass. The ‘raku-style’ mimics an age-old technique used to create a iridescent sheen on pottery. In our class we use iridescent glass to achieve the same affect. Create a wall vase to that matches your home decor and style. The vase holds water so you can put fresh cut flowers in it! You may let the glass speak or itself, or embellish it Class includes instruction, glass, accessory glass (optional), 1 to 2 kiln firings, and the cord for hanging. Instructor will grind edges and drill holes for hanging after final firing. In this class you will design and create four-4 inch tiles that are unique to your design sense. This class is great for beginners! The cost is $40 and includes four base tiles, accessory glass, and a kiln firing. You may opt to create a single coaster/tile for $15. Although the name is Wine Chiller, this vessel has a multitude of uses besides chilling a bottle of wine. It can be used as a planter or just as a decorative piece on a table or shelf. You will begin with a clear piece of glass and add your own color and design. It is made with two layers of glass which makes it quite sturdy. It requires 2 firings. $150. Art glass may be used on request and is priced accordingly. In this class you will make a votive candle holder to create romance and ambiance. You may choose to create a basic holder where the beauty if the glass speaks for itself, or embellish it with accessory glass. The class includes glass, accessory glass (optional) and kiln firing. Need somewhere to put your keys when you get home for the day, jewelry, candy? These dishes are perfect for those and many other uses. You have a choice of a 6 X 6 or 8 X 8 inch dish. Class includes instructions, single layer of glass, and firing. The cost is $35 & $45 respectively. Add $10 for a second layer of clear glass. It’s never too early to start making Christmas ornaments. You have a choice in this class of making a tree, wreath, poinsettia or snowflake–or think outside the box and design your own ornament. Make one ornament for $20 or 2 for $30. Class includes instruction, glass, and hanger. 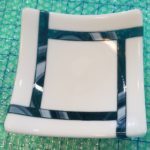 This class combines fusing and slumping techniques to create a large fused glass square platter. You will start with a solid clear piece of glass and add color for design. The cost is $40 to $55 depending on the options you choose. No experience required for this class. Class includes instruction, base glass, accessory glass, up to 2 kiln firings. Add $10 for second solid layer of glass for a thicker platter. We offer a variety of projects suitable for children. The projects change periodically as new classes are added. A ‘Round’ The Beach: This class is a popular one at Glass Impressions and is offered on a regular basis. In this class, artists as young as 5 can create their memory of the beach. No glass cutting is required. The design is done using a pre-cut circle and frit, a pattern to follow, and choice of embellishments. Frit is ground up glass that is safe for little hands to touch. The class includes instruction, glass, frit, embellishments, and kiln firing. The finished piece is 5 inches in diameter and costs $20. Bonefish Window Hanging: No glass cutting is required however, glass edges may be sharp. The design is done using small strips of glass and choice of embellishments. The class includes instruction, glass, embellishments, and kiln firing. The cost is $20. Suitable for children ages 10 and up. These pictures are art panels from beginner classes. In this class, you will choose from a variety of patterns (provided by instructor) as a basis for their art panel to match their personality and style. You may opt to bring your own pattern. If so, arrive a few minutes early to discuss with the instructor the appropriateness for the your skill level and time allotted for the class. Class includes instruction, base glass, accessory glass, and kiln firing. Instructor will demonstrate glass cutting, discuss fusing techniques, and provide assistance for student projects. Put your own ‘spin’ on Sun Catchers and Windchimes. You will start with a clear base and use frit, stringers, and dots to design an eye catching, whimsical piece. This class is suitable for artists as young as 13.